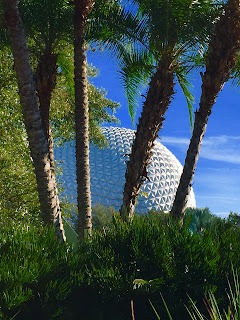 There are so many fun angles from which to take photos of Spaceship Earth. A few days ago I found myself near the exit of The Seas, when I noticed the geodesic sphere through this group of palm trees. I probably have more pictures of Spaceship Earth than anything else at Epcot. I'm sure I will continue to take many more in the years to come.